Place your Withings Aura™ on a nightstand near your bed, so that your face is in the light halo of the product when you are asleep. It should be about one meter (39 inches) away from your head. Select the correct plug adapter from the travel adapter plug set. Locate the top side of the plug adapter (labeled “TOP” on the adapter). Locate the top side of the AC power supply (labeled “TOP” on the power supply). Insert the tab located on the top side of the plug adapter in the notch located on the top side of the AC power supply. Push the plug adapter until you hear a click. Make sure the adapter is properly inserted. If not, pull the button to disengage it and try inserting it again. Connect the power supply cable to your Connected Alarm Clock. Plug the power supply cable to an outlet. A solid dot appears on the display of your Connected Alarm Clock. After a minute or so, the time is displayed (00:00 by default). of your device and pair it from there. It should now appear in the Health Mate app. Tap Pair to pair your Connected Alarm Clock with your device. Enter your first name, surname, gender and birthday. Tap Next. Enter your current height and weight. Tap Create. Tap the Wi-Fi network you want to use or tap Manual configuration. Enter the password of the Wi-Fi network. Tap No yet if you’re only installing the Connected Alarm Clock. Refer to Installing your Sleep Sensor if you also want to install a Sleep Sensor. 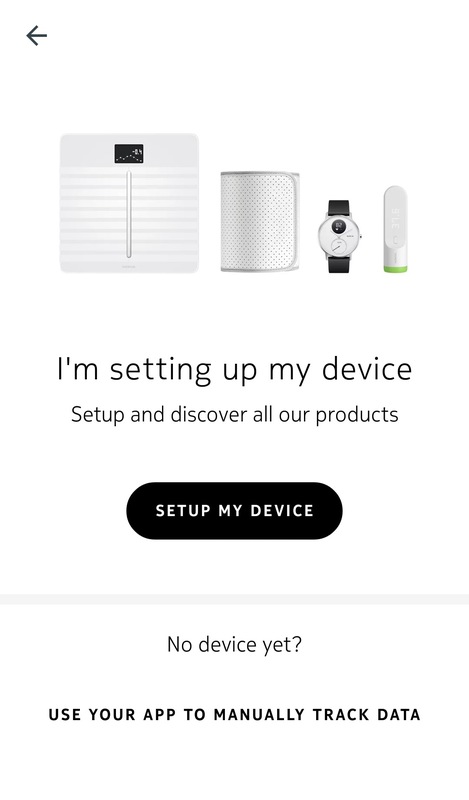 A tutorial on how to use your Connected Alarm Clock is displayed. Go to My devices in the Health Mate app. Tap the Connected Alarm Clock you want to install. If your Connected Alarm Clock is not displayed in the list, go to the Bluetooth settings of your device and pair it from there. It should now appear in the Health Mate app. Provided that you already have a Connected Alarm Clock, up to two Sleep Sensors can be installed. They allow you to benefit from additional features, such as sleep tracking, resting heart rate monitoring, and Smart Wake-Up. You absolutely need a Connected Alarm Clock to be able to set up a Sleep Sensor. Place the sensor under your mattress at the level of your chest. You also have the option of placing the sensor between the mattress and the mattress topper or mattress pad. Make sure you completely unroll the sensor, and that the Withings™ label is facing up. If you sleep alone in a double bed, make sure you place the sensor in the middle of the bed. Connect the sensor to one of the two USB ports to the left of the power connection on the back of the Connected Alarm Clock. Tap the sensor in the Health Mate™ app and tap the user you want to assign. This step is only necessary if you have several users on your Withings account. If you want to install a second sensor, repeat steps 2 to 5. If you want to install the second sensor on another account, refer to Installing your Sleep Sensor on a separate account. The calibration of your sensor starts. This step can last up to 10 minutes during which a LED is lit up and a buzzing sound can be heard. Do not sit on the bed while the LED is on. It will automatically switch off when you can start using the sensor. 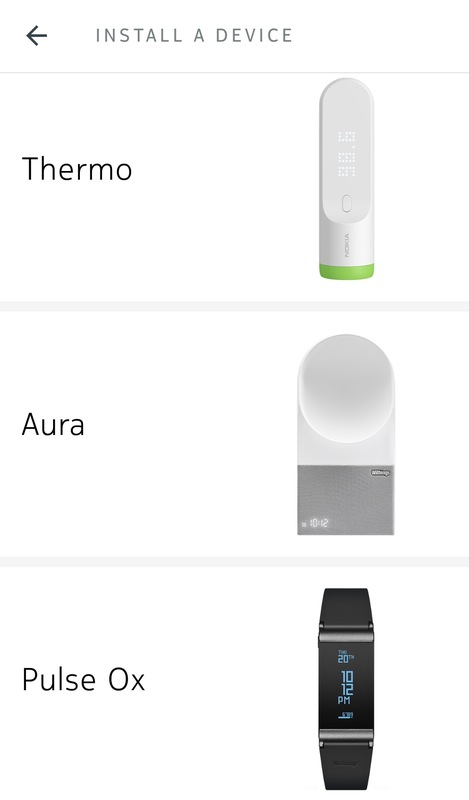 Tap Aura Connected Alarm Clock. Tap Install a new Aura sleep sensor. Tap the sensor in the Health Mate app and tap the user you want to assign. If you want to install a second sensor, repeat steps 5 to 8. Log in to the Health Mate app as the user of the second sensor. Install your Connected Alarm Clock on this account. Refer to Installing your Connected Alarm Clock for more information. Refer to Installing your Sleep Sensor at the same time as your Connected Alarm Clock for more information. Can I use Sleep with my Withings Aura?